Bird hunting dogs give pet owners the ability to hunt waterfowl and other birds with ease. This is because bird hunting dogs will go through anything--weeds, water, mud, snow and more--to bring back a bird that you shot down. While training a bird hunting dog may require a lot of work, the end result is very rewarding as your dog won't just be successful at hunting waterfowl, he'll also become a loyal, obedient and lifelong companion. 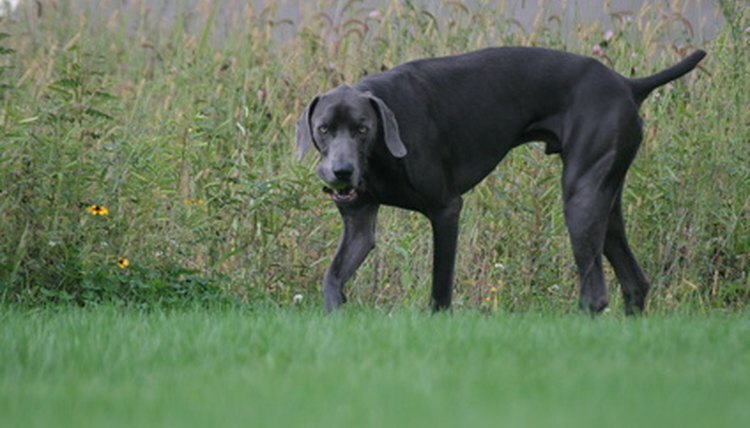 Keep in mind that some dogs are easier to train as bird hunting dogs than others. The best breeds for bird hunting are Terriers, Spaniels, Pointers and Retrievers. Start out with a puppy instead of an older dog. Though it would be nice to have a dog that is already trained to hunt birds, it's better to build up your relationship with your dog by training him yourself. This way, your dog will become loyal to you easier throughout the training process. Teach your dog all of the basic commands, such as "sit," "stay" and "come." This will prepare him for the more difficult commands required for hunting birds. Reward your dog with praise or dog treats to guide him through the learning process. For example, when teaching the command "sit," give your dog treats each time he sits down while training. Of course, you should also be potty training your dog, as this will teach him obedience. Introduce your dog to water. Some dogs are afraid of water or just don't like to get wet. If your dog discovers that water is fun when he's young and he also gets rewarded for playing in the water, he'll enjoy splashing in the water when hunting for waterfowl. Introduce your dog to a small pool first to give him time to get used to the water before going to large bodies of water, such as creeks, small rivers and lakes. Praise him each time he goes into the water and returns to you, as this will teach him that he has done something good. Teach your dog the difference between a waterfowl decoy and a real waterfowl. Before taking the dog outside for training, set up decoys around the yard. Take the dog outside and throw real waterfowl dummies close enough to the decoys so that your dog notices them. This training tactic will help your dog get used to the smell of waterfowl. Reward your dog each time he retrieves the waterfowl dummies and not the decoys. Try to train him daily. Note that the waterfowl dummies you use can either be dead waterfowl birds that you have hunted down yourself, or you can purchase waterfowl or duck dummies in a local pet store or on the Internet. Teach your dog to hunt waterfowl in water. Place waterfowl decoys around a small pond and then throw real waterfowl dummies across the pond for your dog to retrieve. Reward your dog each time he brings back a waterfowl dummy. Introduce your dog to hunting situations. Bring your bird hunting dog to target practice with you so that he gets used to the sound of gunfire. This will prepare him for actual bird hunting when you shoot down birds. He will also be more relaxed when he goes out hunting the first time. Train your hunting dog to flush out hidden birds. Hide four to five dog treats around a bush or rough area. On the first day of training, help your dog find the treats by leading him over to them. Every day afterward, hide the treats in a different area and be less and less helpful until your dog has gotten used to finding the treats on his own. When you believe your dog is ready, stuff a few socks with dead birds and hold them up to your dog's nose so that he can smell them. Then, making sure that you're dog isn't nearby, hide the stuffed socks along with one or two dog treats in another area and then have your dog find them. Praise your dog once he locates the stuffed socks. After several weeks, take your dog to an area where there are real birds. If he hunts down a bird, reward him with a dog treat. Teach your bird hunting dog to blind retrieve. When you shoot down a bird, your dog most likely won't be able to see where the bird lands, so he'll need to retrieve it blindly. Set up a few decoys around a large area of land to teach your dog to ignore objects that he shouldn't be retrieving. With your dog inside or out of sight, place a dead bird among the decoys and then go get your dog. Go with your dog to help find the bird. Once he finds it, reward him with a dog treat. As weeks go by during this training, gradually stop helping your dog find the dead bird once he learns what he needs to do in order to get praised. He'll begin to seek out the bird on his own. Also, practice blind retrieving in different weather conditions--wind, rain, snow, fog, etc.--so that your dog gets used to all of it. Once your dog is ready, start shooting down the birds and encourage your dog to go retrieve them. Train with your dog often so that he'll improve his hunting performance. Try to use realistic hunting scenarios during training so that hunting will be more natural for your dog the first time he hunts for birds. Christina Crowe began writing professionally in 2008. She actively writes for eHow and Answerbag, specializing in health and business. Crowe studies English at Western Connecticut State University. What Is a Mud Hen?